Copyright 2017 American Meteorological Society (AMS). Permission to use figures, tables, and brief excerpts from this work in scientific and educational works is hereby granted provided that the source is acknowledged. Any use of material in this work that is determined to be “fair use” under Section 107 of the U.S. Copyright Act or that satisfies the conditions specified in Section 108 of the U.S. Copyright Act (17 USC §108) does not require the AMS’s permission. Republication, systematic reproduction, posting in electronic form, such as on a website or in a searchable database, or other uses of this material, except as exempted by the above statement, requires written permission or a license from the AMS. All AMS journals and monograph publications are registered with the Copyright Clearance Center (http://www.copyright.com). Questions about permission to use materials for which AMS holds the copyright can also be directed to the AMS Permissions Officer at permissions@ametsoc.org. Additional details are provided in the AMS Copyright Policy statement, available on the AMS website (http://www.ametsoc.org/CopyrightInformation). 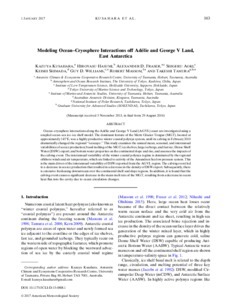 Ocean–cryosphere interactions along the Adélie and George V Land (AGVL) coast are investigated using a coupled ocean–sea ice–ice shelf model. The dominant feature of the Mertz Glacier Tongue (MGT), located at approximately 145°E, was a highly productive winter coastal polynya system, until its calving in February 2010 dramatically changed the regional "icescape." This study examines the annual mean, seasonal, and interannual variabilities of sea ice production; basal melting of the MGT; ice shelves, large icebergs, and fast ice; Dense Shelf Water (DSW) export; and bottom water properties on the continental slope and rise, and assesses the impacts of the calving event. The interannual variability of the winter coastal polynya regime is dominated by the regional offshore winds and air temperature, which are linked to activity of the Amundsen Sea low pressure system. This is the main driver of the interannual variability of DSW exported from the AGVL region. The calving event led to a decrease in sea ice production that resulted in a decrease in the density of DSW export. Subsequently, there is extensive freshening downstream over the continental shelf and slope regions. In addition, it is found that the calving event causes a significant decrease in the mean melt rate of the MGT, resulting from a decrease in ocean heat flux into the cavity due to ocean circulation changes.